Who do you talk to when you want to find something that's been lost? Well, if you're a resident of the Young Kingdoms in my mid-90's Stormbringer campaign, you talk to Obkdy. If you're completely insane or unbelievably desperate, that is. The Isle is no more than a gigantic cavern, and new arrivals find themselves on a ledge a few yards above the cavern floor. They watch from there - generally in horror - as Obkdy reveals himself from the deep shadows of the cavern. Obkdy's Mouth 1: "I -"
Obkdy's Mouth 2: "- am -"
Obkdy's Mouth 3: "- Obkdy." Obkdy's Mouth 1: "Son -"
Obkdy's Mouth 2: "- of -"
Obkdy's Mouth 3: "- Tulu." Obkdy's Mouth 1: "Tell me -"
Obkdy's Mouth 2: "- what -"
Obkdy's Mouth 3: "- you seek." Obkdy's Mouth 1: "I will -"
Obkdy's Mouth 2: "- help you -"
Obkdy's Mouth 3: "- find this dagger." Obkdy's Mouth 1: "But I -"
Obkdy's Mouth 2: "- require -"
All Obkdy's Mouths at once: "- a sacrifice." Drovis thinks for a moment. Then, with a burst of coiled muscle, he grabs the Death-Priest with one gigantic hand and liberates from him his ceremonial knife. Before the confused clergyman even has time to understand what is happening, Drovis drags the knife roughly across his throat and hurls the bleeding, gurgling priest from the ledge - directly into one of the demon's slobbering maws. Obkdy's Mouth 2: "Farewell, my friend -"
Obkdy's Mouth 3: "- you have served me well." The rest of the encounter is pretty basic, with Obkdy revealing the location of the dagger, and explaining what Drovis can do to get it back. When their business has concluded, the demon regurgitates the Death-Priest's diadem so Drovis and Companion may return to the cave - and pass it on to the newly promoted Death-Priest-in-training. 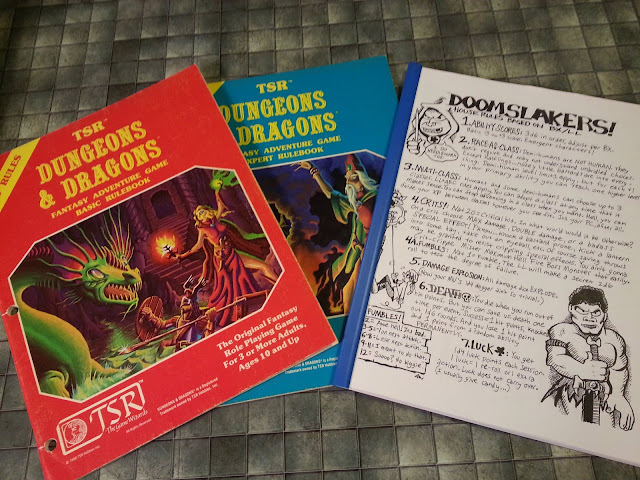 So, since this post has turned into a minor epic, let's get to the good stuff: the record sheets for Obkdy, Son of Tulu, Hoarder of Lost Secrets, and the Eye of Obkdy. "Try Obkdy brand Death-Priest snacks, now with less salt." Sounds like Drovis was quite the chaotic, wasn't he? 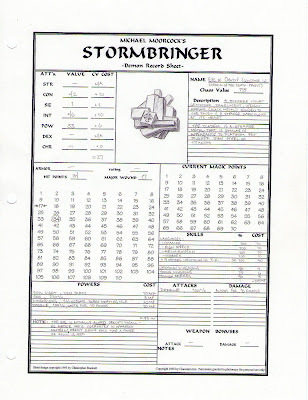 Every time I read one of your Stormbringer posts I yearn to play the game. 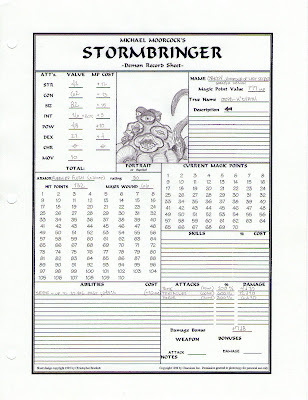 It is one of the few old-school D&D-like games that I never played - worse, my own D&D campaign that I've been running for ever is strongly based on the Elric / Stormbringer Young Kingdoms setting. @Dyson: It is definitely a fun game to play - if you've got the right players, of course. Then again, there's really no reason it couldn't be played with the D&D rules, IMHO. It's more about the spirit of the setting than about the rules themselves, after all.